This was meant to be a back-to-back race, with 29.3 miles on the Saturday, from Cotgrave to Grantham and then back again on the Sunday. The route was the canal path, which, apart from the odd lock was flat and easy under foot. The race was organised and started by Rory Coleman, an MDS vet and ultra runner of note, and very nice guy too. Starting from the sports centre in Cotgrave, and after a minor loss of way, we got to the canal path after 1½ miles. The initial pathway was gravel on hard trails, with no give and this would cause problems later combined with low bridges. Checkpoints were at about 5, 10, 15 and 21 miles and supplied water and sweets, and a chance to stop. 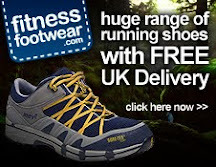 Most runners were training for the MDs and there was a plethora of Raidlight back-packs and M1100MDS trainers, although expecting it to be very wet underfoot I ran in my Asics Gel Cumulus trainers, and glad I did. As after about 16 miles the trail turned to grass and mud and the trainers started sinking in and letting in the water and mud. This would have been bad news for the MDS trainers and I wanted to train in those in the next few weeks with a full pack. On this race I was carrying very little, only about 4kgs, and only in the 10 litre pack as well. However disaster struck after 14 miles on a very low bridge, who you had to go under on your haunches and I felt my right calf stretch and within a few hundred yards I was reduced to a trot and by the next checkpoint at 15 miles my target time of 4hrs 30 was gone. I could only run/walk to the finish and took 3 hours to complete the rest of the distance. Still happy to have done the race distance and finished 28th from 70, but concerned about the damage I may have done and that there was a run back the next day. Once I had finished it was off to my room and grabbed a bag of ice for the calf. A quick shower and some food and then an hour on the bed with ice on my leg. I couldn’t stay too long as Rory had organised a Doctor for Medical certificate signing and ECG taking, thankfully I was recovered in time to pass both, and then stay for a seminar on the MDS by Andy Mcmenemy, who had completed the 2007 MDs and 2008 Namibia desert race as well, and who passed on some very good tips on foot care and other ideas too. After that I shuffled off to the room, hoping for a good nights sleep (no chance), and being ok for the Sunday run. Sunday came and I went home. No running at all. The calf had stiffened in the night and was pulling on the upper Achilles tendon and I was not prepared to risk all for the sake of not having a DNS against my name on the race. I wasn’t the only one as others had seen sense and were resting niggles in anticipation of the bigger days to come. The damage wasn’t long lasting and I was out running, albeit for 3 miles, on Monday and although stiff in the thighs and energy not up to peak, the calf felt better, if not perfect. So next is the Marathon Des Sables. I have another 3 weeks of training, and tapering and 100 miles total left on my training plan. Time is still on my side to stretch the calf and take it easy on the longer runs.